just up the pike: high costs are a big reason people move away from cities. but sometimes, they just want to live somewhere else. A lot of writing about housing in the District says minorities, immigrants, and low-income people are being pushed out of the city due to high housing costs. That's true for many. But even if DC were more affordable, some may not choose to live there. And that'd be okay. A street festival in Long Branch. As suburban communities become immigrant hubs, more people move there by choice. All images by the author. This trend isn't new in the DC area. 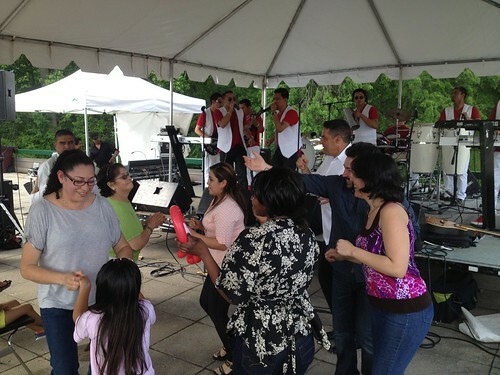 Long before the District's economic boom, the area's minority and immigrant communities had established roots throughout the region: Blacks in Prince George's County; Central Americans in Langley Park; Ethiopians in Silver Spring, Vietnamese in Seven Corners, and so on. 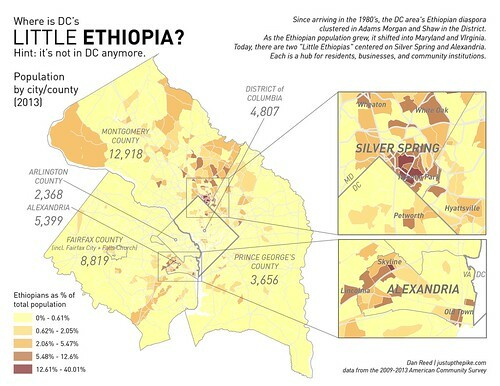 Like many DC-area immigrant communities, Ethiopians have moved out of the District. That may have something to do with lower housing costs. But it also may have to do with the desire to live in a suburban place. I've seen this firsthand as a first-generation American from a Guyanese immigrant family. Many members of my mother's generation, who emigrated to and grew up in Columbia Heights and Petworth during DC's worst days, left even as the city improved. Our family isn't wealthy; my relatives are cab drivers, mechanics, and shop owners. But they didn't leave because DC was too expensive. It was that my relatives wanted to live in communities like Hyattsville and Fairfax, where they could get a house with a yard and a car while remaining close to the neighborhoods they already had social ties to. However, that doesn't mean that non-white communities have no interest in urbanism. As a professor at the University of Maryland ten years ago, Dr. Shenglin Chang found that Latino and Asian immigrants to the United States wanted to live in suburban communities like what they saw in American popular culture, but with walkable, compact places where they could be close to family and friends. That's a big opportunity for communities like Rockville, which has a large Chinese population and is building a town center around its Metro station. It's great that people in the District and other close-in communities are thinking about rising housing costs. Making it more affordable to live closer-in, near transit, jobs, and shopping, means stronger neighborhoods, less traffic congestion, and less environmental damage. 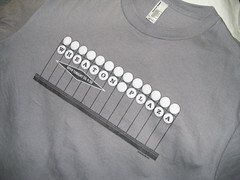 It also means that more kinds of people can live in the District. 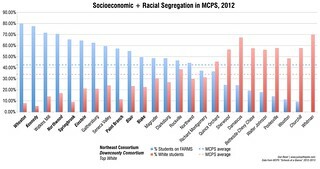 But it's not a guarantee that the District will become more diverse. This is an excellent article. Thank you for taking the time to write a positive perspective on our area.